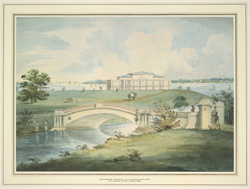 Watercolour of the Governor-General's House at Barakpur in West Bengal, by Edward Hawke Locker (1777-1849), c. 1808. Inscribed: 'E.H. Locker 1808' and on the original mount: 'The Governor General's villa at Barrackpore on the river Hooghley. Drawn on the spot by Edward Hawke Locker, 1808'. Barakpur is located 14 miles from Calcutta and was originally a permanent barracks. When Marquess Wellesley took over the Commander-in-Chief's residence in 1801, he decided to make improvements to the area. He created a summer residence for future Governor-Generals' and he landscaped the gardens while adding an aviary, a menagerie and a theatre. As a result, Barrackpore Park became a popular place for leisure pursuits. The house in this view was commandeered by Wellesley as his country retreat and originally had three large rooms opening onto a verandah. Sir George Barlow, Governor-General from 1805-1807, converted the verandah into a series of smaller rooms. In 1814-15 the building was extended by the addition of a new storey by the Marquis of Hastings. George, Viscount Valentia, in his Voyages and Travels, Volume 1 (1811), described the house as being: 'pleasing, well adapted to the climate and the rooms on a very ample scale'.